Home > Evangelism > Get A Life! What's the true message of Resurrection Day? It's simply that Jesus has come so that you and I might "Get A Life!" 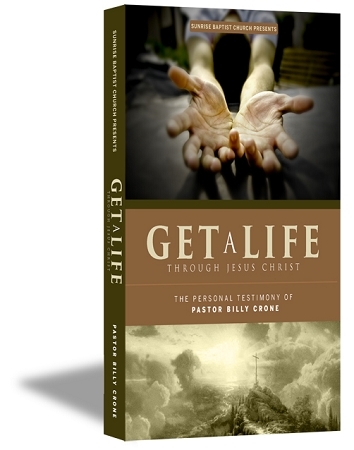 And one of the most effective ways in explaining this wonderful message of Resurrection Day is to share the account of a person who did "Get a Life!" from Jesus, Pastor Billy Crone. "Get a Life!" is the true testimony of the earthly rags to heavenly riches story of Pastor Billy Crone who turned by the grace of God from being a former drug addict, Heavy Metal head banger, sexually immoral, male chauvinist pig, to Preacher of the Gospel. However, this message to "Get a Life!" is not merely for a select few. It's graciously available for everyone who would call upon the Name of the Lord. You'll not find life in the things of this world. You cannot fill that hole in your heart with drugs, pleasure, power, position, prestige, or even religion. You can only fill that hole in your heart by Getting A Life! from the Source of Life, Jesus Christ! That's what Resurrection Day is all about!